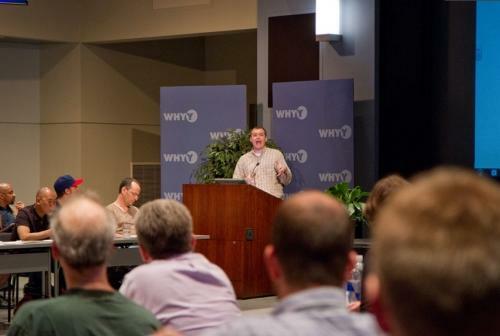 More than 120 people crowded into the Dorrance Hamilton Public Media Commons at WHYY to watch a data catalog unveiled. The event was a part of Philly Tech Week. Ten dozen people, including developers, journalists, nonprofit leaders, city representatives and the curious hung around for an hour, with standing room only left, to be there when OpenDataPhilly.org officially kicked off. That says something about the Philadelphia technology community and its interest in the online transparency movement around government. Local GIS shop Azavea built the thing, with some direction from a stakeholders group, and on behalf of Technically Philly I found myself in the interesting role of both reporting on it and being a part of catalyzing it: helping to organize the unveiling and being charged with actually getting people to use it. Much more to come on that front, which remains a major part of the Transparencity grant I am currently leading. I’ll get up video of the unveiling soon. Real interest in good government initiatives exists, considering the 150 people in attendance for the noontime unveiling of a data catalog. My original plans were to have 20 developers in a room for this unveiling, but instead there was a diverse array of stakeholders. OpenDataPhilly separates itself from other city data catalogs because it was built independent of city funding or leadership on its construction, as reported here. Azavea built the platform and Technically Philly’s responsibility was to host the unveiling, get people in the room and continue use of the utility. I think we’ve done well by that task, but I think that work gets lost on most. While I often will ignore my notes anyway, I think should take care to prepare something to say when I speak, like kicking off and closing this event.